I am so excited about this necklace. Don’t you just love when you make something that you are so in love with? 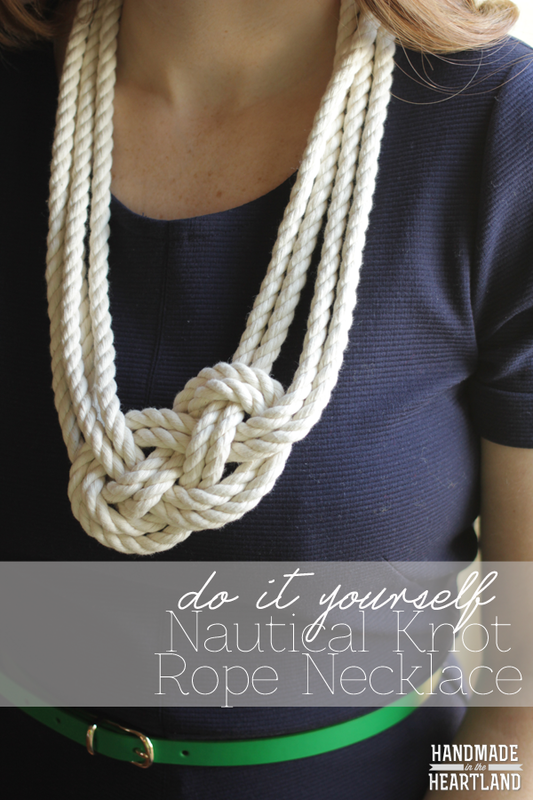 When i was getting all my ideas together for the DIY jewelry segment i did yesterday on fox4 this necklace wasn’t even on the list, i was making some bracelets out of rope and then it hit me, nautical knot! 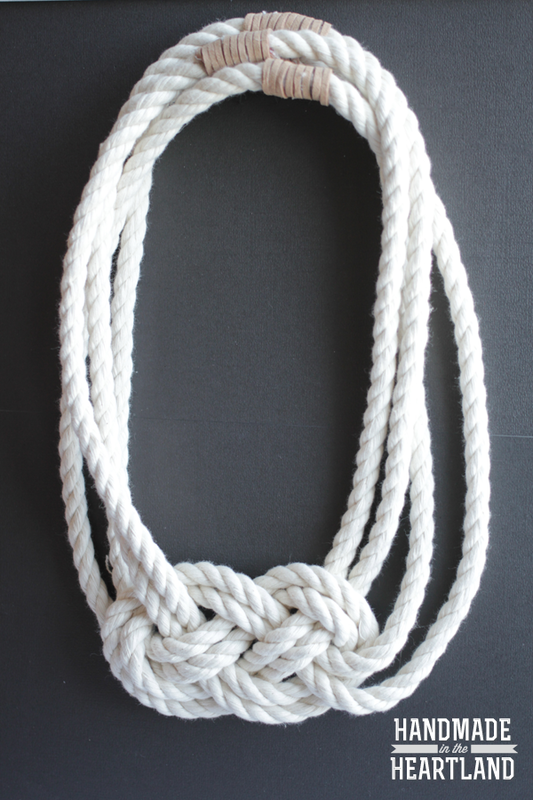 I had seen a few nautical knot ideas on pinterest and i still have a huge roll of rope in my basement (its the rope i use for handles on my market totes), so i started playing around and its my favorite necklace i’ve made to date. 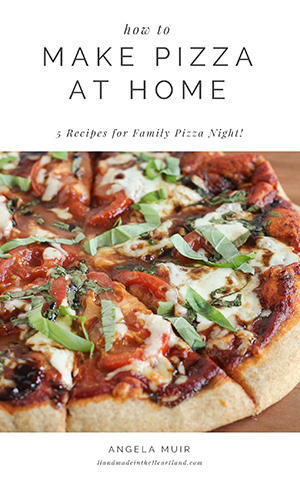 I’m so happy to share this tutorial with you today! When you cut your rope use the scotch tape and wrap it around the ends so the rope does not fray, this also makes it easier to glue the ends together when making the necklace. 2. Then move the left loop on top of the right loop. You want to line them up so that the place where the ropes cross are in the center of the other rope’s open loop. 3. You are then going to weave the rope together so that each strand follows an over under pattern. This part is hard to explain with words, my best advice is to look closely at the pictures and copy them. I found it easiest to start at the ends and follow them around the knot, weaving as you go. 4. Once you have the rope woven correctly, pull the ends to tighten the knot. I found it easiest to pull the top ends on the right and left a few inches, then pull the bottom ends as much as you did the top. If you pull too much on either the top or the bottom your “tails” will be different lengths. So as you pull make sure you are keeping the ends the same length. 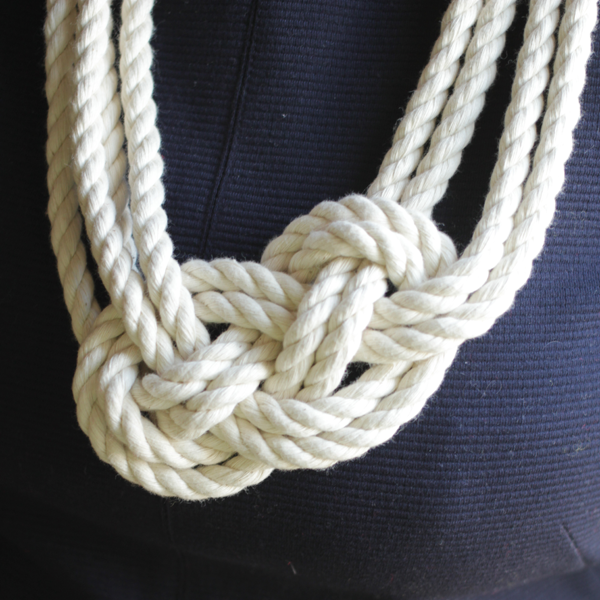 Pull until it is a tight compact knot. Make it into a necklace! 1. Lay out the knot and form the tails into a circle. You are going to notice that the strands on the inside of the circle are longer and will need to be cut. I started with the outside strands. 2. Hot glue the ends together. Use the outside strands as the measure for the 2nd, 3rd and 4th ropes. You want them to be the same length stacked on top of each other. You may need to cut some of the ends to make them the same length as the first pieces of rope that you glued. 3. Once they are all glued put a dab of glue about a 1/2″ to the side of the glued seam and stick the end of the suede on it. Wrap the suede string around the rope until it hides the seam and then secure it with another dab of hot glue. I wrapped each strand separately.